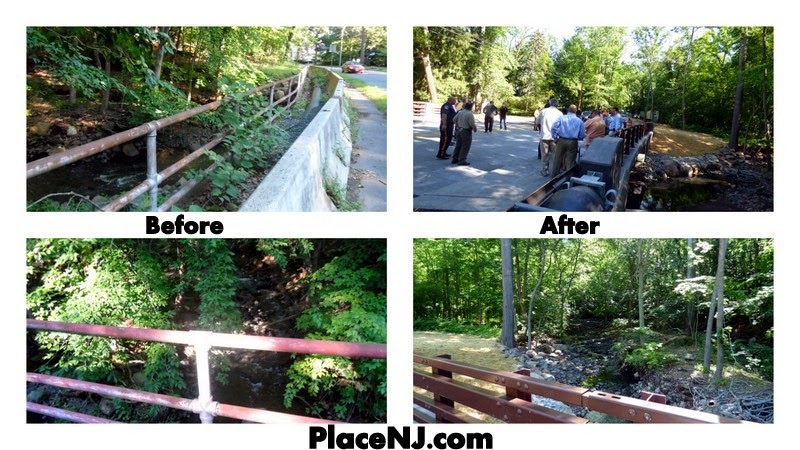 The Glen Avenue Bridge over the West Branch of the Rahway River in Millburn reopened on Friday, two months early. The bridge, which is located between Brookside Drive and Lackawanna Place next to South Mountain Reservation, had been closed to pedestrians and motorists since February. Pedestrians were required to use the pedestrian bridge near the Millburn Free Public Library and motorists were detoured through Downtown Millburn. A grand reopening celebration and ribbon cutting were held on Friday morning Attendees included Essex County Executive Joseph N. DiVincenzo, Jr., Millburn Township Mayor Robert J. Tillotson, and Essex County Engineer Sanjeev Varghese. "Glen Avenue provides crucial access to the area around Essex County South Mountain Reservation, through the Township of Millburn and to the township’s Downtown Business District. We knew from the start that closing the road to reconstruct the bridge would be a major inconvenience to residents and motorists, and we worked diligently with our contractors and the township to minimize disruption and move the project ahead of schedule", DiVincenzo said. Verghese told attendees that before the bridge rehabilitation, the bridge was one of the last structurally deficient bridges in the county. Sparwick Contractors, of Lafayette Township in Sussex County, was the construction company hired by the county. Sparwick was awarded a competitive bid contract for $970,331. The closure of the bridge had prevented access to the Millburn Free Public Library from the west, however library officials anticipate that library visitation will increase because of the bridge reopening "For the last several months, in-person visitation to the library has been down 8%. While part of that was, undoubtedly, due to the harsh winter we all endured, most of the decline is attributed to the road closure, which made accessing the library difficult for a lot of residents. We now expect visitation to return to normal levels", said library director Michael D. Banick. "July was our busiest month in 2013 so I am particularly glad that our customers will once again have easy access to the MFPL in time for the summer". The bridge was originally constructed in 1908. The bridge rehabilitation included replacing the existing deteriorated deck, reconstructing the existing concrete abutment walls, replacing the guide rail and bridge railing system, and replacing the curbs and sidewalks on both sides of the bridge. The project was funded by the New Jersey Department of Transportation’s Local Bridges Future Needs Program.